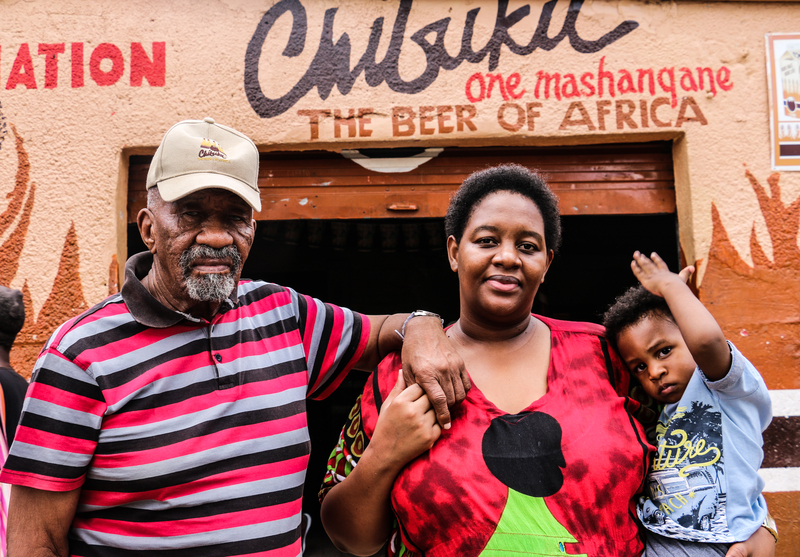 In Kliptown, Soweto’s oldest residential district, the Oushun family has played a significant role in the community for over 50 years. Peter Oushun has made it his mission to keep the art of drinking traditional beer alive. 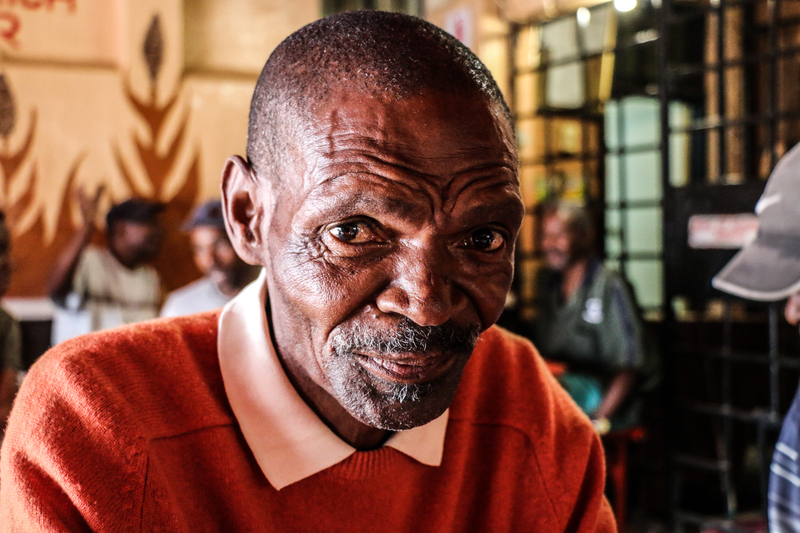 The 87-year-old man’s tavern remains the longest standing tavern, providing solace to the employed, unemployed, young and old community members of Kliptown. “Kan ek ‘n plein een kry? (Can I get a plain one please),” a 66-year-old coloured woman by the name of Margret Wax asks the bartender. He passes her a one-litre carton of Chibuku plain through a small window with metal burglar bars. She shakes the carton, opens it up at the top corner, careful not to tear the paper fabric of the carton. She then takes a big sip of the sour, thick malt fermented drink and sighs in relief. A thick white foam remains on her upper lip. “Chibuku must be drunk sitting down,” Peter Oushun says to her as she makes her way to take a seat next to him. 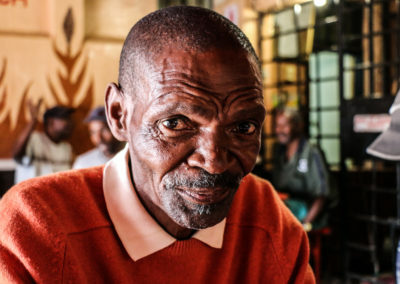 He is the owner of the shop and has a habit of mingling with his customers as they indulge in drinking traditional beer at his tavern every day from 10 a.m. to 10 p.m. It is 11 a.m. on Sunday, September 29. Of the taverns that are open for those returning from church services, only one is busting with life. Oushun Place on Beacon Road seems to be the place to be. Vibrant Kliptownian customers come in one by one, old with a few young ones, either ordering a Chibuku plain or the banana flavour which is the most requested by customers. Customers sit on benches in the dark tavern with just the light from the sun making its way through the doorway. They sit in groups conversing and laughing about their stories from the weekend as if replicating the traditional customs of families conversing over a jug of traditional umqombothi. The tavern is simple and the atmosphere is peaceful. Everyone is laid back and relaxed, sipping their own “khathun” (carton) of Chibuku. Margret continues to drink hers. She doesn’t seem bothered by the fact she is the only woman drinking in the tavern at that time. She has been one of Peter’s loyal customers since 1976. “I prefer Chibuku more than bottled beer. Bottled beer is acid,” she says. Peter nods his head in agreement just as he is about to give a breakdown of how he believes that Chibuku can change Africa’s problems. The 87-year-old man loves to talk about the traditional beer business that took him and his family from rags to riches. To the left of the bartenders’ window, there is a black gate which divides the tavern from Peter’s home, in the style of many of the homes connected to businesses in Soweto. There are two doors. Behind one is the storage room for all the Chibuku bought from South African Breweries (SAB), and the other leads to Peter’s home. Peter sits in the sitting room on a green leather sofa watching the crime channel via his DStv decoder on a big plasma television. On the walls hang photos of his family and quotes about African culture and freedom. A rotating fan blows cooling air, although he is dressed in a winter hat, black sweater and thick red woolen trousers. “You know I started this business with just five cases in 1976,” he says. Peter explains that in those days, people didn’t want to drink Chibuku. “It was very low among the coloured people. 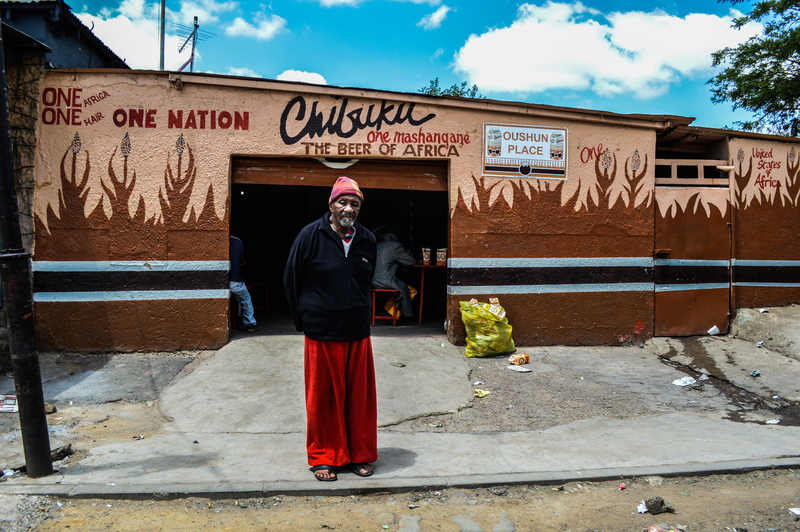 They used to call it kaffir beer.” He knew an Indian man named Chunara who owned a Chibuku store which was closing down. “I am going away, coloured people don’t drink this,” Chunara had said to Peter. 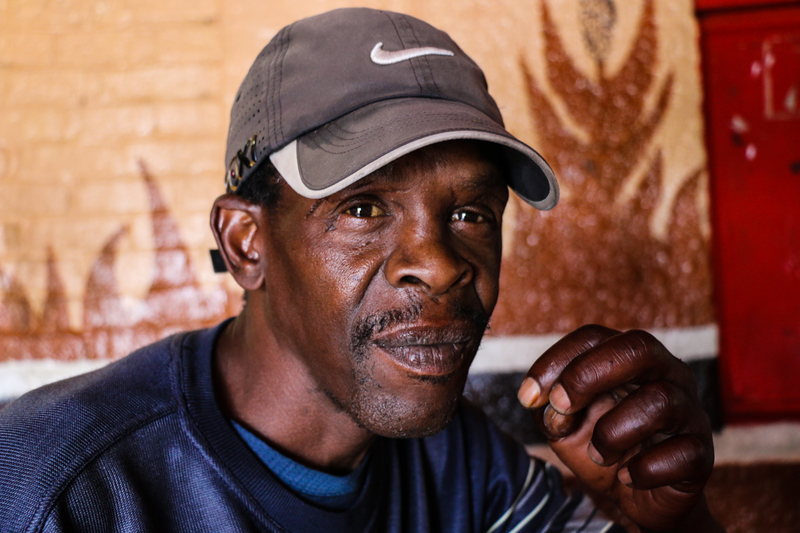 SELLING SORGHUM: Peter Oushun’s family has made a living from the sale of traditional sorghum beer to the Kliptown Community for decades. FILLING FLAVOURS: The banana-flavoured Chibuku is the most requested by Oshun Place customers. At the time Peter had just left his job as a vendor selling sweets on the train. He then bought the land and shop from Chunara. According to Peter’s granddaughter and heir, Shoenelle Ogbonmwan, Peter slept in the empty shop for six months trying to protect it from thieves. It was the year that beer halls in townships were burnt down. One of the tavern employees comes in and asks Peter if he is ready to have his lunch. She brings him some biryani and beetroot. Shoenelle confirms this when she says, “He bought me my first car, my first townhouse, because of this shop.” Oushun Place has sustained three generations: Peter, Peter’s daughter Shyanne, and her daughter Shoenelle. A FAMILY AFFAIR: Peter Oushun poses with his granddaughter, Shoenelle Ogbonmwan, who will inherit the tavern, and her son, Amadeo. It is now 1pm. Different faces can be spotted back in the tavern, many of them elderly coloured men. They stare at me with bewildered eyes. They seem to be wondering what a 23-year-old girl black girl dressed in polka-dot a skirt, holding a camera and notebook, could be doing in this tavern? Marget is sipping her third round of Chibuku. This time she is seated at a table with two gentlemen, very quiet men who have travelled from Johannesburg to Kliptown for a drink at Oushun Place. I join them, and Peter joins us. 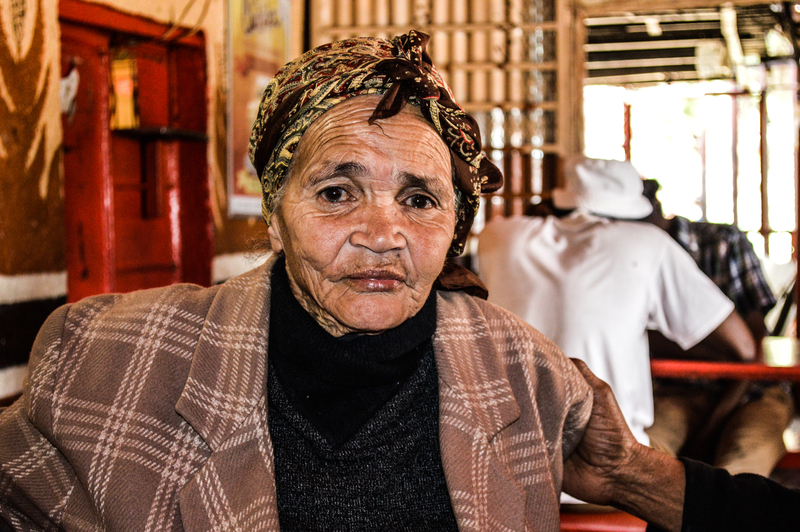 “You know, ever since I have been drinking this, I do not get constipation,” Margret says, looking at me with a wise, wrinkled face, and eyes with the irises circled with grey lines. Peter jumps in the conversation to add more benefits of Chibuku. He has philosophies about them written up on the walls inside and outside the tavern. “Sorghum beer is good for pregnancy, breastfeeding and high blood pressure”; “One Africa One Hair, One nation”; and “Chibuku, one mashangane, the beer of Africa”. SHORT LIVED: Similar to that of a fly, Chibuku’s shelf life is approximately four to five days. 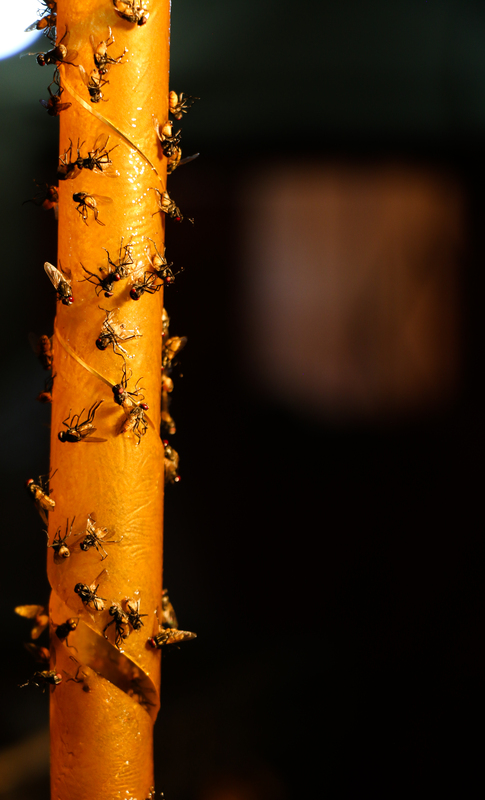 A fly trap is kept inside the storage room at Oushun Place to capture the flies attracted to the Chibuku sorghum beer. In 2014 the Gauteng Liquor Board (GLB) introduced new regulations which significantly affected Oushun Place. One was that, “Taverns and pubs have been merged into a single category licence” and another, “Shebeen licence traders will only be allowed to sell alcohol until 10 pm. during the week”. These were attempts to curb noise pollution in residential areas and to limit negative exposure of children and residents to beer. Peter does not agree. He insists that because Chibuku is a traditional beer it should not have the same regulations as regular alcohol. “Chibuku is a breakfast for blacks before they go to work!” he says passionately. “I’m not selling beer, I am selling sorghum!” he added. Through this logic, it makes no sense for the tavern to open at 10 a.m. As a result of his belief Peter says he once had to sleep in jail because he refused to get a liquor licence. “Oupa will always believe that Chibuku beer is natural. He even refused to get a licence because of that,” Shoenelle says. “We lost a lot of money because of that. They took away 250 crates every second day,” she adds. Peter even wrote letters to the presidency. In one letter, written on May 20, 2009, titled “Promoting sorghum beer” and addressed to President Jacob Zuma he advocates for sorghum beer and its benefits. 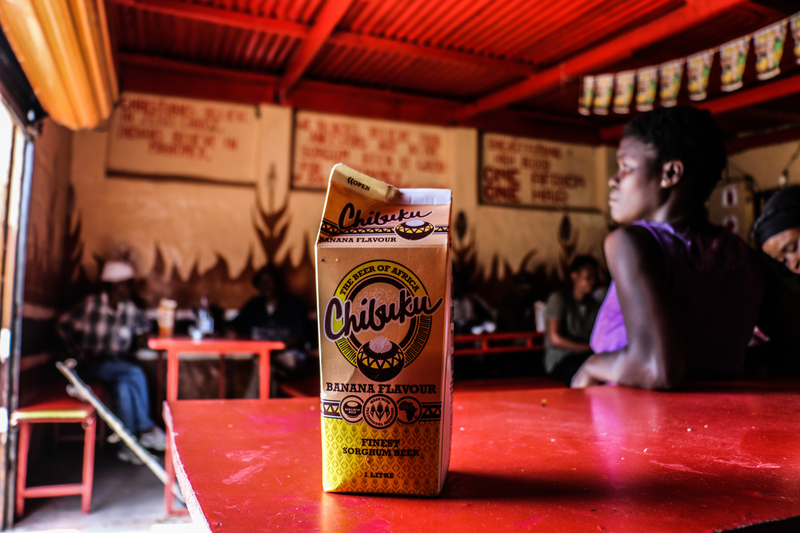 According to production manager of United National Breweries (UNB), where Chibuku is brewed, Chibuku falls under alcoholic beverages because of its percentage of alcohol after the fermentation period. “It produces a maximum of 3% to 3.5% of alcohol after 3 days,” he says. “We don’t sell it as alcohol but because of the properties it has it is classified as that,” he adds. According to a report from Eye Witness News in July 2017, “Government wants to tighten the screws on the production and sale of malt and sorghum beer, including traditional African beer.” This may cause further problems for Peter’s business. However, after the jail incident, Shoenelle says they managed to “pull through” and finally obtain a liquor licence and Oushun Place became a big name with UNB. “They [UNB] offered Oupa to become a distributor for the whole of Soweto, but he declined,” she says. She blames his decision on being very “set on his ways”. Johna Mabasa set up her small shop across Oushun’s Place selling roasted chicken feet to community members and some of Peter’s customers. 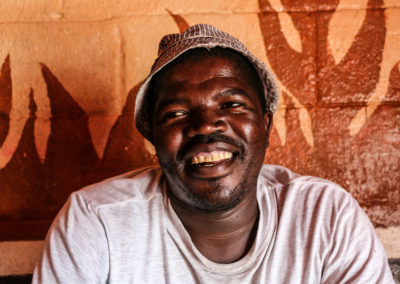 Sylvester Ntukela used to own a store which sold carpets called Bio Industrious. He likes to shake his chibuku carton for at least a minute before drinking it. Margret Wax has been coming to Oushun’s Place ever since it was established in 1967. She is one of Peter’s close friends. Khaya Phantshwa originated from the Eastern Cape to Johannesburg to search for a job. He often visits Oushun’s Place for a drink or two. Bridget Peacock is Peter’s oldest existing employees and she runs the day to day sales of Chibuku at the tavern. 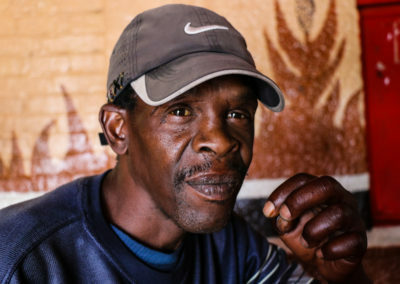 Samuel Manona usually sells super glue and stickers on crown reef road near Maponya Mall. He can gulp down a carton of chibuku in one go. Samantha Anthony is often asisted by her son as she takes care of Peter’s house and tavern. She makes one of the best Briyani meals. 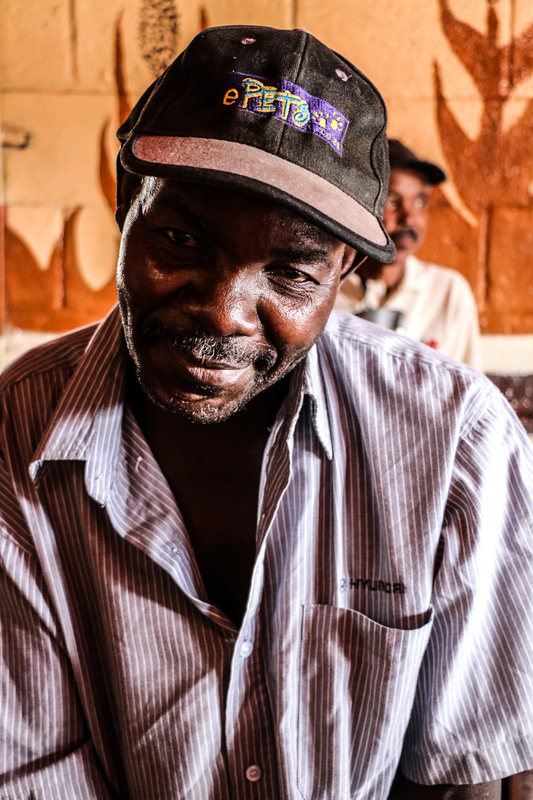 Moses Chisi, works at a community center behind Oushun’s Place and enjoys the chibuku plain flavour. Preserving African traditions and cultures to Peter is of utmost importance. But what’s even more important to him is his loyalty to his customers. They love Oushun Place. It is one place that they seem to get a break from all the troubles they experience. At least one community member thinks so. 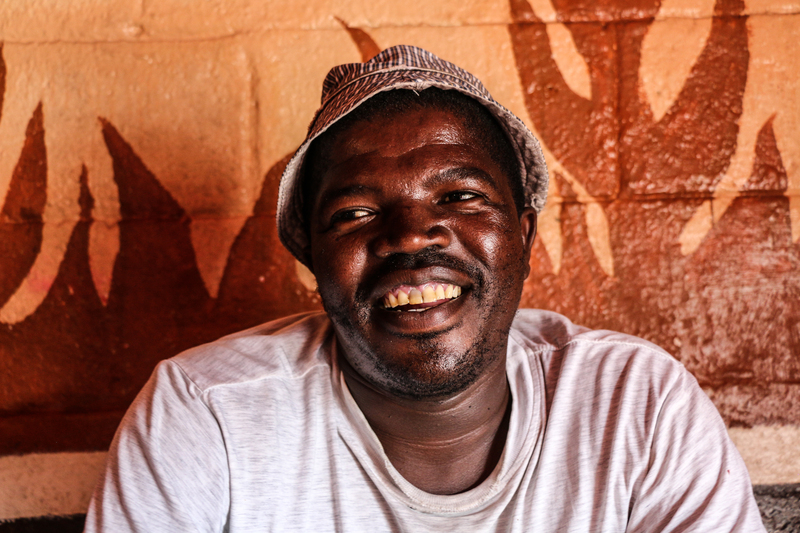 A local security guard named Patrick Shongwe says the tavern is always packed. Even in Soweto they do sell this drink but here [in Kliptown] it is very popular,” he says as he waits to collect his shoes from the shoesmith neighbouring Oushun Place. 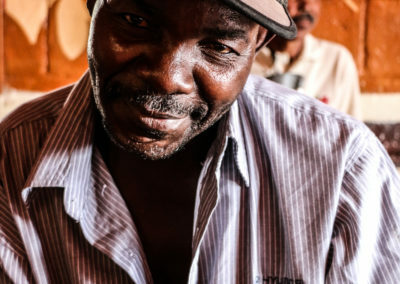 Although Patrick doesn’t drink, he is convinced that the community members drink as a way to escape from their problems. “The problem is that they are not working, that’s why they can enjoy themselves. And it’s cheaper, unlike buying beer. So whatever they get, that amount they buy the beer,” he says waving one hand in the air while the other tries to fit his refined shoe on his foot. Unemployment is a huge issue in Kliptown. According to the most recent statistics from Wazimaps and Stats SA, as of 2011, Kliptown’s unemployment rate is more than 60%. This is evident as young and old people can be seen loitering along the streets. That’s if they aren’t Chibuku drinkers. “Crime is very rife here; you cannot take chances, especially at night,” Patrick adds, as he carries his shoes away. 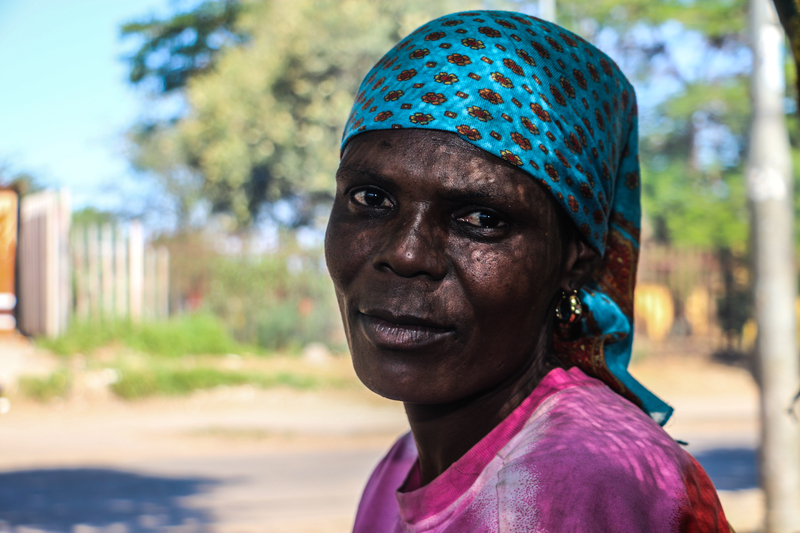 Across the street from Oushun Place a woman named Johna Mabasa sells braai’d chicken feet, called ‘runaways’ by locals. Her stall is held together with torn cloth and wooden sticks, shading her from the sun. Drinkers from Oushun Place like to buy there. 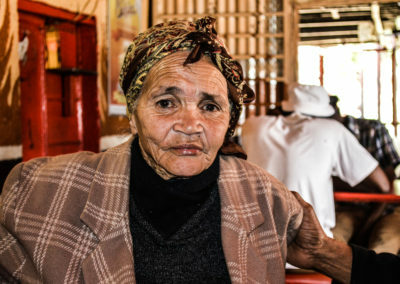 “Ekuseni, nasemini, kugcwele kakhulu, and bayathenga amakhathun (In the morning, in the afternoon, it is always full and people buy the cartons),” she says, turning the chicken feet on her small braai stand. Oushun Place is a source of business for Johna. She has been at the same spot for three years now selling BBQ-spiced ‘runaways’ to Peter’s customers as well as by passersby in order to support her two daughters. “He was very strict, I used to read a page for R5 because at the time Barbie dolls cost R5,” Shoenelle says reminiscing about growing up in the Oushun home. After Peter showed me the letters to the president, he took out from one of the drawers in his room a photo of Shoenelle. He stared into it like she was his prized possession. “Everyone knows he is close to my heart,” Shoenelle says. 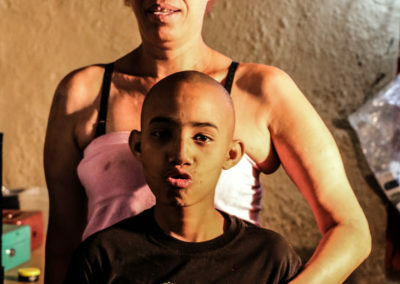 “I’m sure they wonder how hard it would hit me when he is to die. He is my father figure. If I have any issues I don’t lack with him,” she says about Peter. 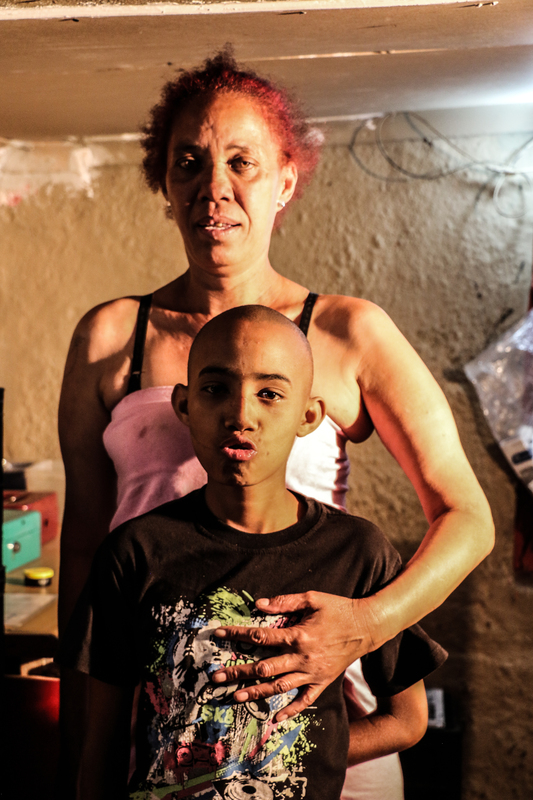 Shyanne, Shoenelle’s mother was a single mother. They moved to the city when Shoenelle turned 12. The shop continued to finance their family, taking her to the best schools and giving her the best education in the suburbs. 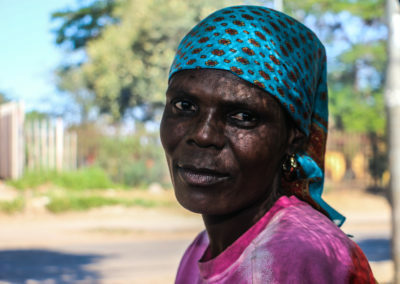 Although Peter would love for her to move back to Kliptown to run the business when she takes it over, Shoenelle doesn’t see herself living there. “There’s nothing there for me, sweetheart. He has been buying these flat screen TVs, and tries to make everything nice for me,” she says. 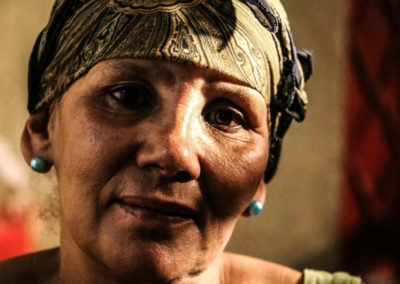 Shoenelle would rather stay in Johannesburg with her husband and one-year-old son. They have adopted the suburban lifestyle of the affluent Winchester Hills. “I can’t take my husband to move there, he has his pride and he has also built a home for us here,” she adds in a frustrated voice. At the moment Oushun Place has been transferred to Shoenelle’s name while Peter continues to manage the tavern. “All I am waiting for is for him to finally rest his eyes in the next five years, my dear.” She says she would like to keep everything the way it is so as to keep her grandfather’s legacy of Oushun Place: “One Nation, one mashangane, the beer of Africa”, and ensuring that it remains a place for Kliptownians, non-Kliptownians, the old, the young, the jobless and the employed to come and enjoy an affordable, thick, malt, fermented taste of Africa’s favourite sorghum beer.